Nintendo Wii - Gadgets Info. The seamless combination of innovation and technology come alive on the Wii gaming console from Nintendo. Equipped with motion-sensing capabilities, the Nintendo Wii has many unique features that revolutionize the way one can play video games. The gaming console can be enjoyed by casual and hard-core gamers alike, as well as gamers of any age. Powered by an IBM PowerPC processor and accompanied with an ATI Hollywood graphics processor, the console is capable of giving you quality visuals for any game you play. The console also has 512 MB internal memory that lets you save game data. The Wii uses a self-loading media bay that plays both Wii gaming discs, as well as Nintendo GameCube discs. The Wii also proves to be a device of information and entertainment as it has a system of on-screen channels, such as the Mii channel, News channel, Internet channel and more. The Nintendo Wii is very thin with a smooth and refined finish. The gaming system has dimensions of 44 x 157 x 215.4 mm. The Wii console is easy to setup on any surface and can be placed either horizontally or vertically. The console is powered through the Wii Power cable, while the Wii Remote controller runs on 2 AA batteries. The console has a SD card slot, Game disc slot, 2 USB ports, AV Output, Sensor bar connector, and a Power connector. The console also has 4 Nintendo GameCube controller sockets and 2 Nintendo GameCube memory card slots for playing Nintendo GameCube games. The buttons on the gaming console are laid our neatly and are easy to operate. In the front portion of the gaming console, the power button is laid out on the left side. The reset button is near the top; close to the bottom is the eject button. You can connect a variety of controllers with the Wii as it is bluetooth enabled. 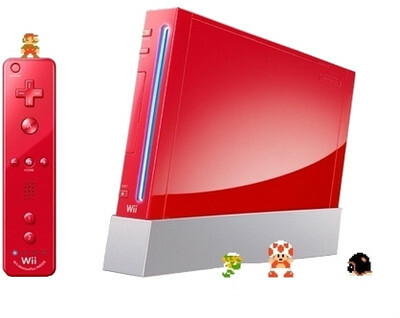 The console is Wi-Fi compatible and can also connect with other Nintendo DS consoles wirelessly. The Wii also has a sensor bar that detects motions and gestures made by the user using the Wii Remote. The sensor bar is small and light and connects to the Wii with a cord. The sensor bar can be easily setup either on top or beneath your television screen. The Wii gaming console supports SD and SDHC memory cards. You can also set parental controls on the system if you want to restrict unwanted content. To set these controls simply click on the Wii button and go to Wii Settings and select Parental Controls. You can connect to the internet wirelessly and access online services such as Virtual Console, WiiConnect24, Internet channel, News channel etc. The console comes with a Web Browser designed by Opera. You candownload game demos, software, classic games, new games or additional data from the Wii Shop channel. The controller unit for the Wii is called a Wii Remote and resembles a television remote control. The remote can be connected to the Wii wirelessly using Bluetooth. The controller is motion-sense enabled and has a signal range of 10 metres. The buttons on the Accelerometer remote are laid out in an orderly design. It comes with a Power button on top followed by a 4-way movement button underneath. The other buttons include an A button, a Home button with volume buttons on either side, and two other buttons numbered 1 and 2. The actions for these buttons differ in functionality with every game you play. The Wii Remote also includes a speaker, and an expansion port through which the Nunchuck can be connected. The Nunchuk is another controller that allows for more specific and complex actions while playing games. It is motion-sense enabled and has 2 buttons along with a Control Stick.